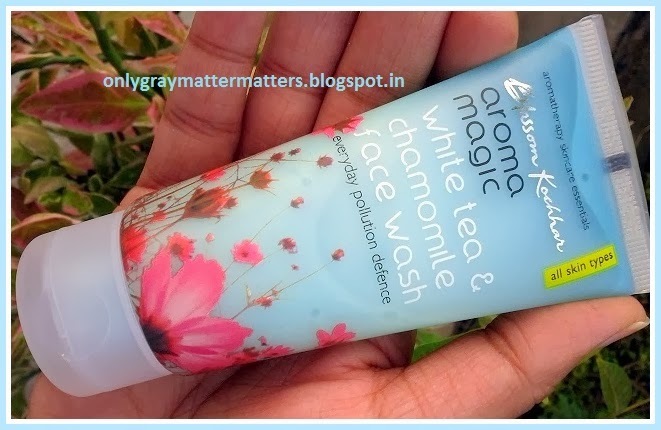 This is a review of Aroma Magic White Tea and Chamomile Face Wash. It is suitable to all Skin types. 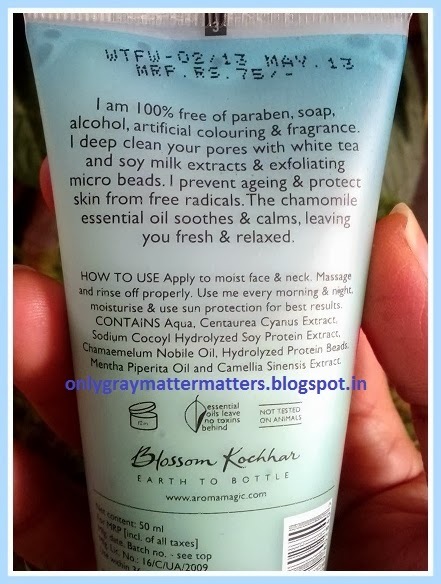 I wanted to try out a face wash from this range since summers after hearing some great reviews. But at that time I was using Soulflower Baby Your Skin soap, so I postponed buying this face wash. 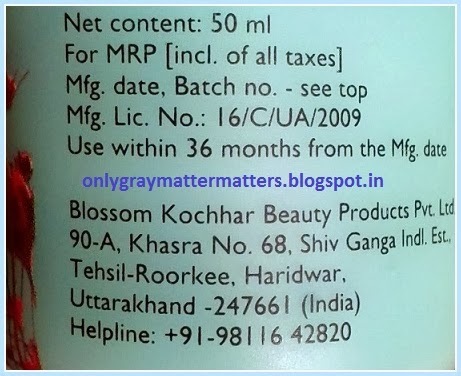 Availability: You can buy from flipkart.com (here and here), amazon.in, joybynature.com, medplusbeauty.com, purplle.com, healthkart.com, slassy.com etc. The entire tube was sealed with lamination. 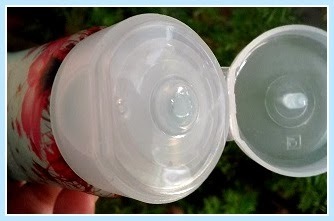 The flip-open cap is sufficiently tight and this face wash can be carried easily in the purse without worrying about leakage. I usually don't go ga ga over the packing as long as the packing is sensible and there is no product wastage. But I just fell in love with the color of this tube and the face wash - it's gorgeous. I thought these are Jojoba beads. But ingredients list says it contains hydrolyzed protein beads. These micro beads are added for mild exfoliation and are not very dense. A single bead comes out with the facewash once in a while. The beads are soft and can be crushed easily. I crush the bead on any dry area of my face and just rub. 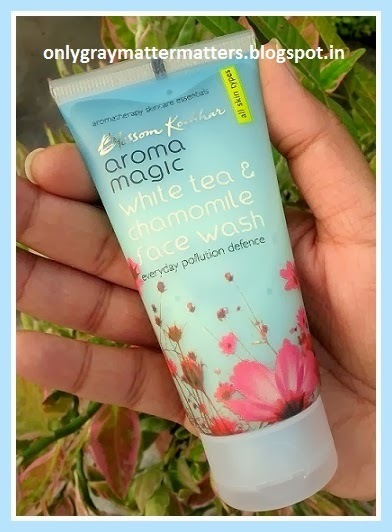 Aroma Magic claims that this face wash is 100% free of parabens, soap, alcohol, artificial coloring and fragrance. Besides the lovely color from natural ingredients, this face wash has a beautiful mild fragrance which lingers on for long after washing the face. The fragrance comes from the essential oils in it. I have an oily T-zone with normal cheeks, which go dry in the winters. Usually any facewash or facial soap I use suits either my t-zone or the remaining normal skin. This is the first face wash ever which leaves my skin squeaky clean without causing any dryness and without enhancing my skin pores. I used it after removing my eye makeup and it gently cleansed every trace of oil and makeup residue without drying my skin. I hadn't used soap on my face for more than 10 years and now I don't feel guilty using this face wash as it is free of soap. I simply loved this product and totally recommend it to those who travel out daily in dirt and pollution. I don't need rigorous face cleansing daily so I might be using it on alternate days. But I am definitely going to try the other variations in the next summers. Update 1 July 2014: It started drying me badly in extremely cold months, from mid November to Feb. I restarted using it from March and it worked well as before without drying my skin. But I was in Gurgaon in April and it created painful dry patches on my face. It overdries skin in dry dusty climate. Back in summers, it is again working extremely well. I even used it as a foot wash and it kept my feet soft and helped repair the dryness in my heels. This small tube lasted me so long I almost got bored of it. But it is damn good and total value for money. I want to try the lavender one next, which is meant for dry skin like mine. Thanks Megha :) I haven't tried removing foundation or heavy makeup with it Megha, just the residue makeup left after using a makeup remover. So am not sure if it can 100% remove oil based makeup. But yes, when I use other products to remove the oil left over after makeup cleansing, they dry my skin. This one does not. Completely agree with you Jennifer especially because I have read your reviews and I personally feel those are very sensible and honest reviews. Yes, it is cute and the color is still hanging in my mind he he. I wish I had a dress in the same color. 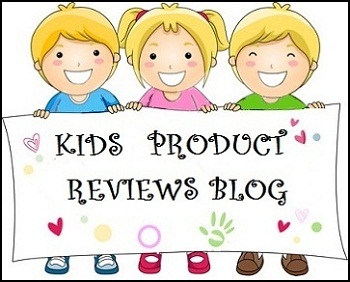 I use aroma magic's lavender oil daily for my son. 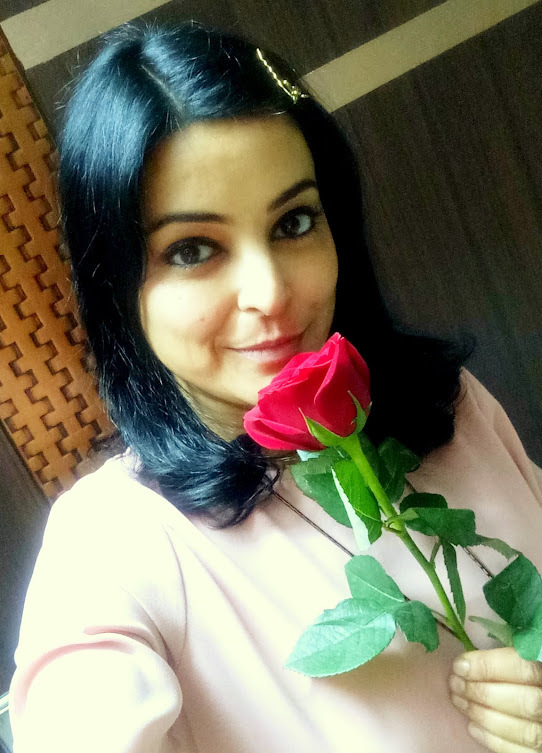 Their oils are not very strong (I feel they are diluted) but still they are good to start with and I am sure it must be feeling like a very happy change Ankita, because you know you are feeding something really safe and good to your body :) I feel elated whenever I use oils. I am sure you would like these. I wish I had tried these face washes earlier in the summers esp the strawberry one. It looks good. I am going to try it soon! Good to now it doesn't makes skin dry like many others. Thanks all. I just finished this face wash yesterday. It was a small pack and yet it lasted soooo long I literally got bored of it. It works great all year round except from mid nov to say Feb, when the weather here is really very cold and dry. I even used it on my feet and it didn't dry my heels like soaps do. So been using it as a foot wash too. Totally awesome product for such a less price.